I’ve been making this recipe for Greek Pasta Salad since my early 20s. Not only is it easy to make, but it’s always well received at family functions and at our own dinner table. When I make this salad, there is rarely any leftovers. You can double (or triple) the recipe to serve a larger crowd. Any kind of pasta will do. I like the look of the rotini noodles, but have also used bowtie pasta for this recipe in the past. If you enjoy the flavour of Greek salad, give this pasta salad a try! It’s fresh and delicious and a recipe that I personally keep coming back to summer after summer. Really you could eat this any time of year, but summer seems to be the season of pasta salad don’t you think? For more pasta salad recipes, check out my Chili Pasta Salad, Easy Bacon Pea Pasta Salad and 15 Pasta Salad Recipes for a Summer Picnic. One of my all-time favorite pasta salad recipes. Don’t count on any leftovers with this recipe! In a large bowl, combine pasta, feta cheese, cucumber, tomatoes, olives and green onions. In a small bowl, whisk together oil, garlic, vinegar, lemon juice, oregano and pepper. Pour over salad and toss gently. Oh man this is my favorite cold salad!! I want to eat this for supper every night when its so hot outside, no cooking and its cold!!! I would use black olives in mine, as well. I know some prefer the Greek olives but I don’t care for them. I think the bowtie pasta is cute. We love Pasta Salad and this looks so delicious! I need to make this cold salad and have it for an easy side dish for my family. I like all the ingredients! Yumm! This looks delicious and refreshing for a hot summer day’s dinner! I love coming and checking what new recipe you have posted, I love that your recipes are so easy and very tasty too, they sure help me get out of a rut! Great looking salad. My son loves pasta salad and on super hot days no one wants to cook and we usually just have a cold salad for dinner. I love all types of salads in the summer especially “Pasta” salads. This one looks delicious! I absolutely will be making this as a side for the 4Th! Thanks for sharing! oh yummalicious!! I have pinned this fabulously tasty salad thank you for sharing it! I love Greek flavours! This salad sounds delicious! 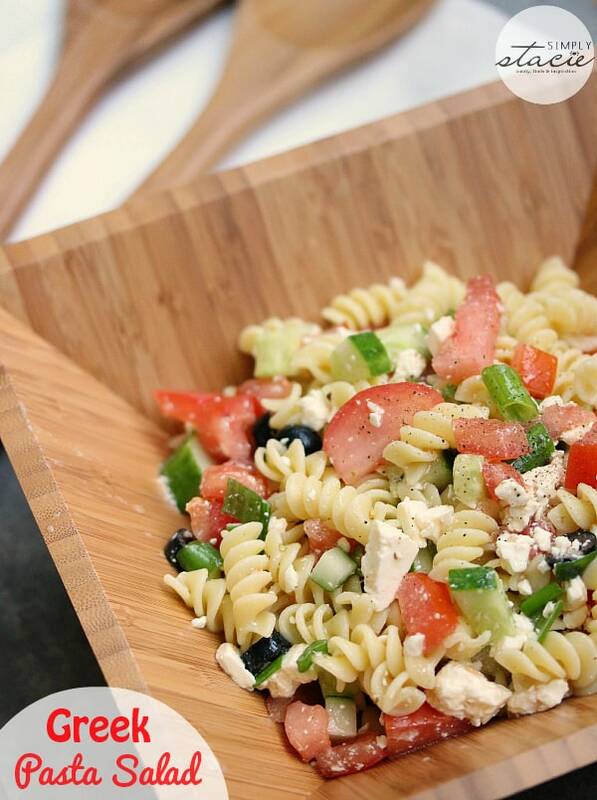 I love Greek salad & pasta- I have to try this delicious looking recipe! I’ve never made a Greek salad with pasta, but I’m definitely gonna try this. I’m sure it will become a family favourite. This looks delicious and it’s fast and easy to make, I can’t wait to try this. Thank you for sharing this recipe. I have been looking at Greek cookbooks and am keeping this recipe, thanks! This sounds so amazingly delicious. Thanks for sharing. This looks great. I love feta cheese and I think my whole family would enjoy this recipe. I can see why this is such a hit with your family and at parties. Great flavors. Always a classic for parties, and one that surely will be eaten by many. Yummy, this looks soooo good. Sounds like a great summer salad! We have a potluck coming up and I might just have to make this for it! This sounds and looks delicious, thank you for sharing. This is my husbands favorite when we go out, I am going to use your recipe to see if I can make it for him, thanks! I like this idea. I love greek salad the traditional way! This sounds better with the noodles. Will also have to try this one. I am going to pin it so I have it. Thanks for the idea. 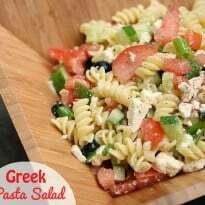 My husband and I both love this Greek Pasta Salad.It’s so refreshing on a hot day.Thanks for sharing this awesome recipe. Wow this sounds great. Thank you for sharing and I am pinning for later!!! I’m a fan of anything Greek. 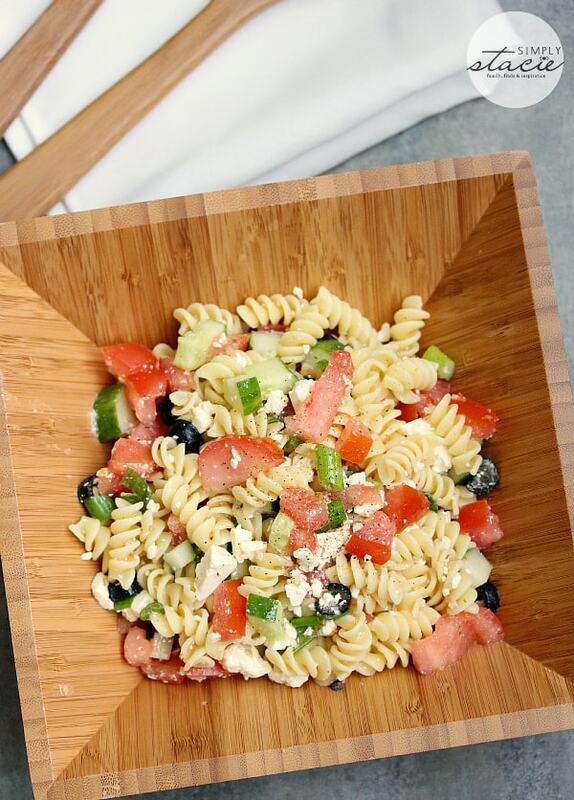 Have never had a Greek pasta salad before–looks good! Nice light, summery dish. Thank you for sharing, Stacie!